How much broccoli can a bad bug eat, if a bad bug could eat broccoli? From experience, we all know the answer is 'all of it'! Is is any wonder that bugs have such a lousy reputation? Fortunately, for every broccoli eater there is an eater of broccoli eaters. Why then, you might ask, was my broccoli completely devoured by multi-legged creatures? The answer is that the good guys probably don't live at your house anymore. So what to do? Most of us are familiar with those bug lore legends, ladybugs and praying mantises, but there are hundreds of other soldiers waiting and wanting to battle for you in your garden. Many years ago, during our annual inspection by the California Department of Agriculture, our inspector strolled leisurely through our fields naming this bug and that bug. He seemed to be enjoying himself and it made us rather nervous. Finally, we had to ask, " Are we in trouble here?" He gave a hearty chuckle and declared that it had been a long time since he had seen so many BENEFICIAL INSECTS in one place. It turned out he was an entomologist, a really knowledgeable bug guy. It was the beginning of our education about how beneficials live and what they need to hang out in our garden. Spring and summer are perfect times to look for some of these good bugs. As flowers open, look at what is flying around. 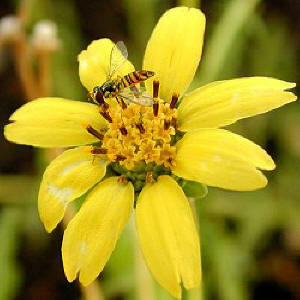 If you find insects lounging on the flowers and not eating your leaves, there is a good chance these are your heroes. For most insects life has three stages. The egg stage hatches into the larvae which in turn grows into an adult who then lays more eggs and so on. The larvae are usually like young children with insatiable appetites. The normally eat far more than the grown-ups (sound familiar?). The good little larvae of the world eat bad grown-ups! For example, the tiny alligator like larva of the Lacewing consumes 30 to 50 adult aphids per day. A curious example of this is a tiny little wasp called Aphidius (notice the similiarity to Aphid?) maticariae. An 1/8 inch long the Aphidius takes great pleasure in laying its eggs inside aphids. From within the aphid, the Aphidius larva glues the aphid to the leaf, consumes it and spins a minuscule papery brown cocoon, essentially turning the aphid into a mummy. From this cocoon, emerges a new warrior wasp. It is not uncommon to see an entire colony of mummies where once only aphids dared to go. No more aphids. Well, almost. In order for there to be good bugs there have to be some bad bugs. Even a good bug has to eat, right? It is a balance we are looking for. Ok, so how do you get some of both? It all comes back to the plants. If you have ever hiked through a forest, you may or may not have noticed the bugs. There are usually lots of them. When you stop to examine that spectacular patch of wild flowers or that incredible stand of wild blueberries, it will probably escape you that they are virtually undamaged by insects. Why? Because of plant diversity. The smorgasbord of plants has attracted beetles, dragonflies, wasps and flies that are standing by waiting to charge after bugs that might damage their nectar supply. Because these dinner guests each have their own 'tastes', or requirements, it is necessary for our gardens to have many different kinds of plants. Ok, so maybe you don't want a forest full of native weeds in your backyard. Sometimes the original species of a plant can be kind of plain. Fortunately, there are many cultivated choices that are more attractive. Yarrow is a good example of this. Dingy off-white yarrow is found throughout temperate North America. It grows along roadsides, in vacant lots, and even at the top of mountains. But, dingy is not a color most of us are fond of. Luckily, we can choose a more colorful counterpoint to the white Yarrow. Whichever color of yarrow you choose, you will also be encouraging beneficial insects just as if you had planted the common white yarrow. Another reason for plant diversity is that good bugs are different sizes. The size of the diner dictates the size of the flower he will dine at. Small beneficial insects, like the hover fly on the Chocolate Scented Daisy on the right, like small receptacles they won't drown in and so on. As an adult, this little fly is an important pollinator. As a larvae it will consume mountains of aphids, scales, thrips and caterpillars. Indeed hover flies are just as ravenous and beneficial as ladybugs and lace wings. Daisy like flowers provide perches and an open drinking fountain with just the right size straws (stamens) for small beneficial insects. Landscaping for beneficials is exciting! Make your garden your private oasis. Here are some of our suggestions to create a beautiful beneficial paradise for two, you and your bug buddies. Insect pests usually show up first and the temptation might be to not wait for the beneficial predator to follow. But, remember that sprays and powders that get rid of pests, not only destroy the food supply of the beneficial insect, but also destroy the eggs of the beneficial insect. It may take several weeks for beneficial populations to arrive after the pesky insect first appears. It also seems that insect pests are becoming more resistant to sprays and tend to come back more often than those that are left to nature. Also, plants should be given the best soil and plenty of water and food. Plants under stress actually emit chemical messages that invite bugs to come on over. Whatever kind of garden you have in mind, think diversity. This will give you the balance you need to create a restful place for you and your insect workers.